People say you fight fire with fire. Well, maybe you can also fight tiny microorganisms with other microorganisms. 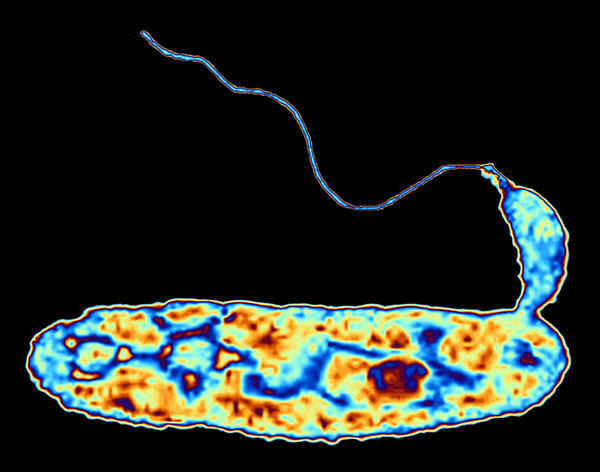 For bacteria that cannot be stopped by antibiotics, you may be able to go after them with germ-eating predators. Scientists hope they may even be able to use these predators in the event of a germ warfare attack. Here's NPR Science correspondent Richard Harris. RICHARD HARRIS, BYLINE: Nature is filled with predators, so it's no surprise that there are predators that hunt down and kill bacteria. And it turns out that some of these predators or other types of bacteria. BRAD RINGEISEN: Actually, they're found in almost every ecosystem on Earth. HARRIS: Including inside of us. Brad Ringeisen became fascinated with these critters after he took over a program at the Pentagon's Defense Advanced Research Projects Agency. DARPA's aim - to figure out if they could be harnessed to protect us from disease-causing bacteria. RINGEISEN: It's been very exciting. HARRIS: Lab studies that his agency has funded showed that the predatory bacteria will attack all sorts of nasties, including tuberculosis, the plague and deadly germs that have developed resistance to antibiotics. And the star of this show is an organism called Bdellovibrio, an extra-small bacterium that swims around with the aid of a tail. RINGEISEN: Bdellovibrio ended up preying upon 145 out of the 168 human pathogens that we tested, which is pretty remarkable. HARRIS: And different species of predatory bacteria use different strategies to attack. RINGEISEN: They can use what's referred to as a wolfpack. HARRIS: In which they hunt in a group. RINGEISEN: There's also organisms that act almost like a vampire. LIZ SOCKETT: Which are little grappling hooks on the surface of the Bdellovibrio that make initial attachments, a bit like a climber attaching to rocks. HARRIS: This is not only weird and wonderful but this rather blunt-force attack means that bacteria don't seem to be able to develop resistance any more than zebras can develop resistance to lions. Her colleagues have looked hard for evidence to the contrary. SOCKETT: They took the bacteria that had been preyed upon by Bdellovibrio every week and looked for any small survivors in the culture, grew them up again and offered the same bacteria back to the Bdellovibrio. And they did this 50 times over a long period. And we never got any direct mutants that were resistant. HARRIS: So here's an organism that can effectively kill nearly 150 disease-causing germs, and the preyed-upon can't evade. Sounds like they could be incredibly useful. Nancy Connell, who worked for years at Rutgers University studying anthrax and all sorts of other ominous germs, says exploring these predatory bacteria is the most exciting work she's done in her career. NANCY CONNELL: This is the first time that I have felt that we might have a way through many of these different infections. HARRIS: After seeing all the promising work in test-tube studies, Connell and her lab got DARPA funding to see if the germs would actually fight infections in rats. The answer was yes. CONNELL: And so we were able to reduce the number of bacteria in a lung infection in an animal model by treating with the predator bacteria. So that was actually our first and very exciting result. HARRIS: The predators didn't wipe them out entirely as antibiotics might. That make sense because predators rarely eradicate their prey. But her colleague at Rutgers Daniel Kadouri is optimistic that the predators are doing enough. DANIEL KADOURI: We can reduce the numbers to quite a lot. We're talking about 99.99 percent depending on the model that we're using. HARRIS: And Kadouri says, even though it might sound creepy to be deliberately infecting people with bacteria, this seems to be quite safe. They're thinking now about relatively simple experiments in people. KADOURI: We imagine something which is localized, such as a burn infection, a wound infection or a lung infection, will be much more efficient than doing, for example, like a blood infection that it's going to be more difficult for the predator to find the prey. HARRIS: Could this end up being a replacement for antibiotics? Liz Sockett in Nottingham doesn't think so. She suspects that once you give a big dose of this bacteria to people, they will develop an immune response to it that would hobble future treatment attempts. SOCKETT: You would get one shot at using Bdellovibrio. So in England we would call this a fire extinguisher kind of approach, where you use the fire extinguisher to put out the fire. But if the fire extinguisher doesn't work on the fire, you can't go back for a second fire extinguisher. HARRIS: Still, this could be useful in the event of a germ warfare attack, a tuberculosis outbreak or in a patient who has an infection that simply doesn't respond to antibiotics. Of course, we won't know whether it works at all in people until researchers put that to the test. That's the next step - and a big one.